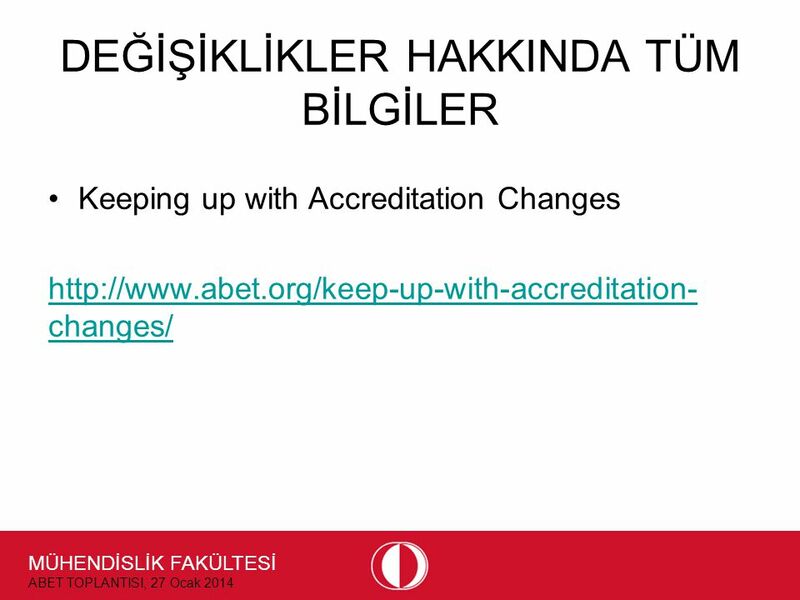 5 MÜHENDİSLİK FAKÜLTESİ ABET TOPLANTISI, 27 Ocak 2014 DEĞİŞİKLİKLER SON HALİ (2014-2015 Criteria for Accrediting Engineering Programs) Criterion 2. 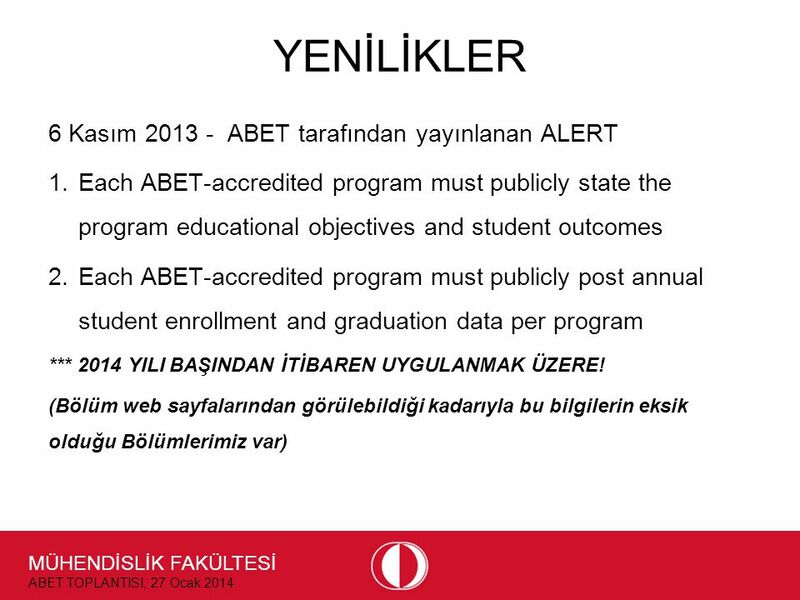 Program Educational Objectives The program must have published program educational objectives that are consistent with the mission of the institution, the needs of the program’s various constituencies, and these criteria. 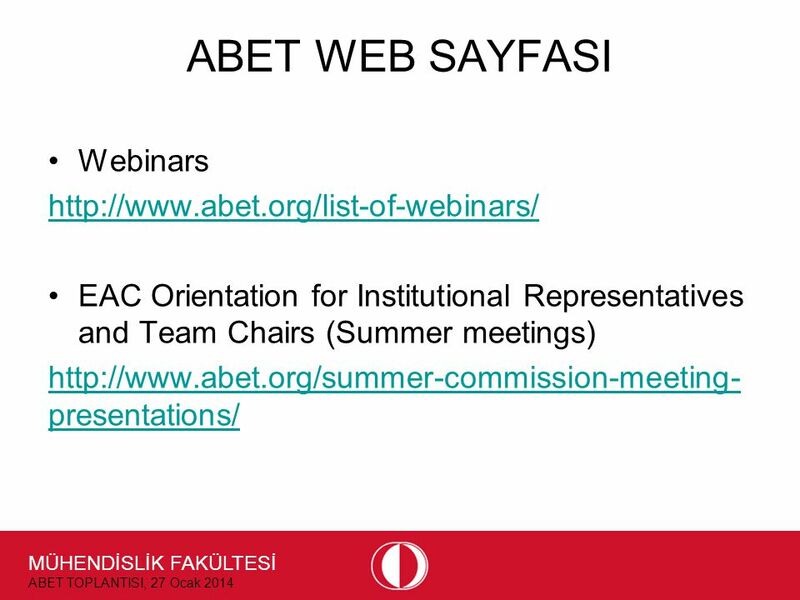 There must be a documented, systematically utilized, and effective process, involving program constituencies, for the periodic review of these program educational objectives that ensures they remain consistent with the institutional mission, the program’s constituents’ needs, and these criteria. 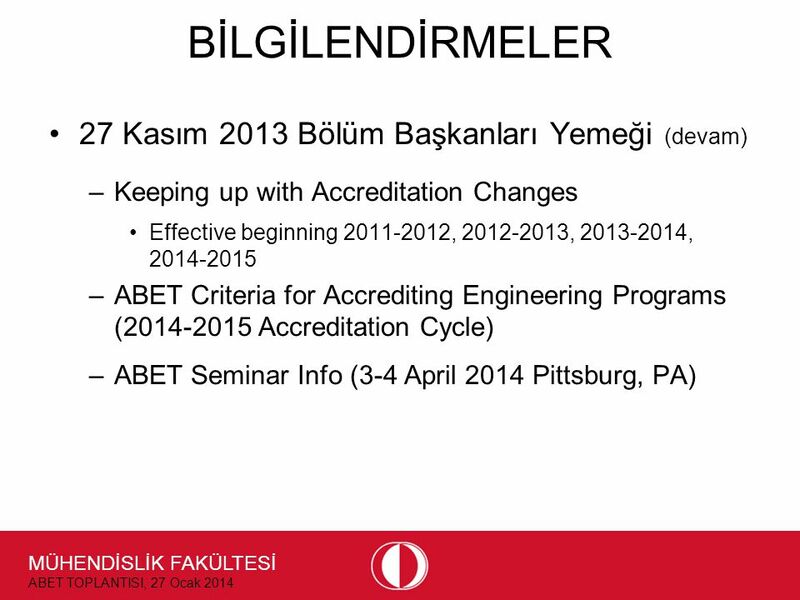 6 MÜHENDİSLİK FAKÜLTESİ ABET TOPLANTISI, 27 Ocak 2014 DEĞİŞİKLİKLER ÖNCEKİ HALİ (2011-2012 Criteria for Accrediting Engineering Programs) Criterion 2. 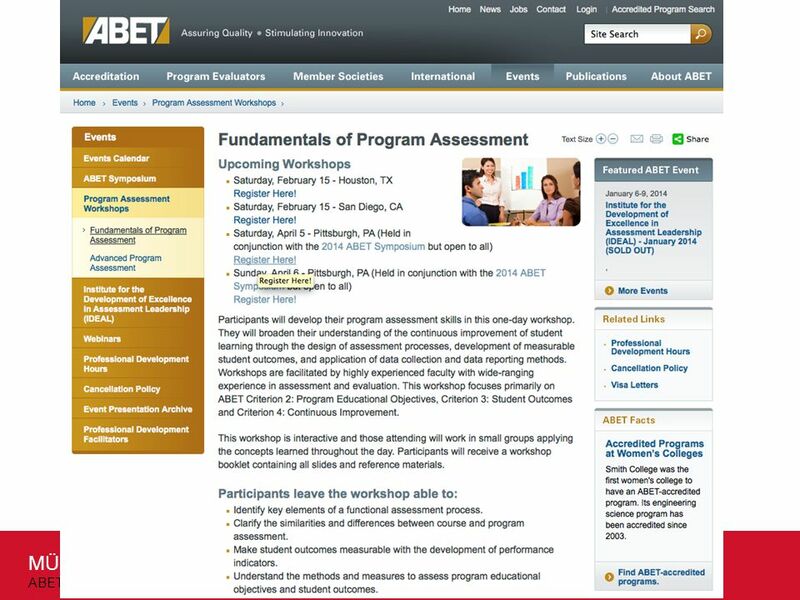 Program Educational Objectives The program must have published program educational objectives that are consistent with the mission of the institution, the needs of the program’s various constituencies, and these criteria. There must be a documented and effective process, involving program constituencies, for the periodic review and revision of these program educational objectives. 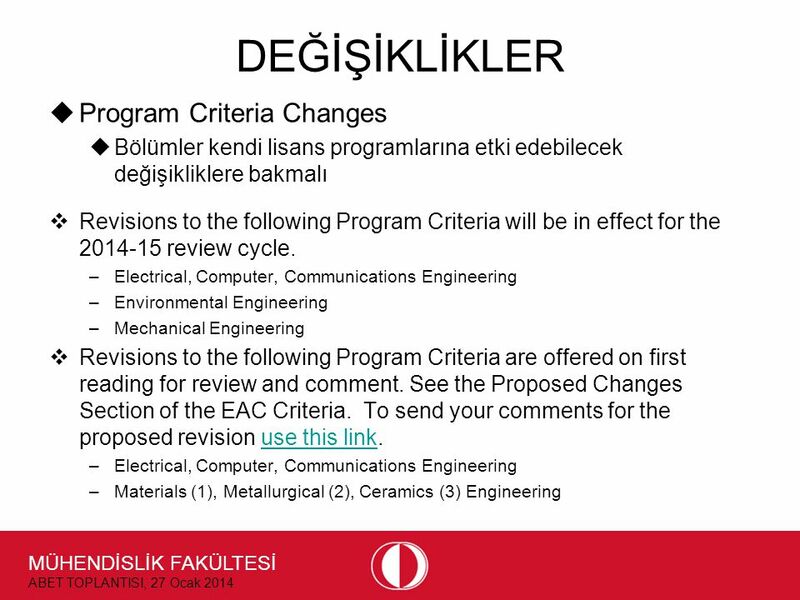 7 MÜHENDİSLİK FAKÜLTESİ ABET TOPLANTISI, 27 Ocak 2014 DEĞİŞİKLİKLER YAPILAN DEĞİŞİKLİK HAKKINDA AÇIKLAMA The change to Criterion 2 removes the requirement for a program to have a process for the "review and revision" of its program educational objectives (PEOs). The new language requires a documented process that is systematically utilized and effective, involving the program's constituents, for periodic review of the PEOs so that they remain consistent with the institution's mission, the constituents' needs, and the criteria. 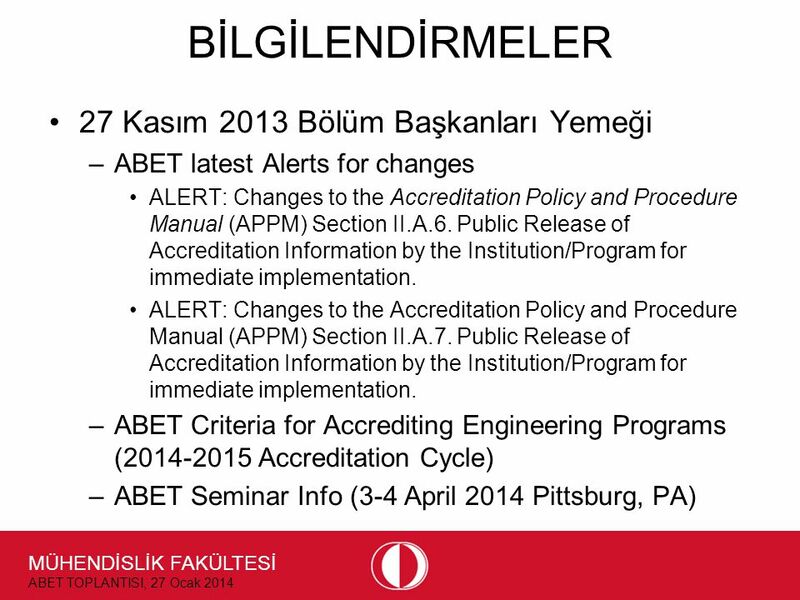 8 MÜHENDİSLİK FAKÜLTESİ ABET TOPLANTISI, 27 Ocak 2014 DEĞİŞİKLİKLER SON HALİ (2014-2015 Criteria for Accrediting Engineering Programs) Criterion 4. 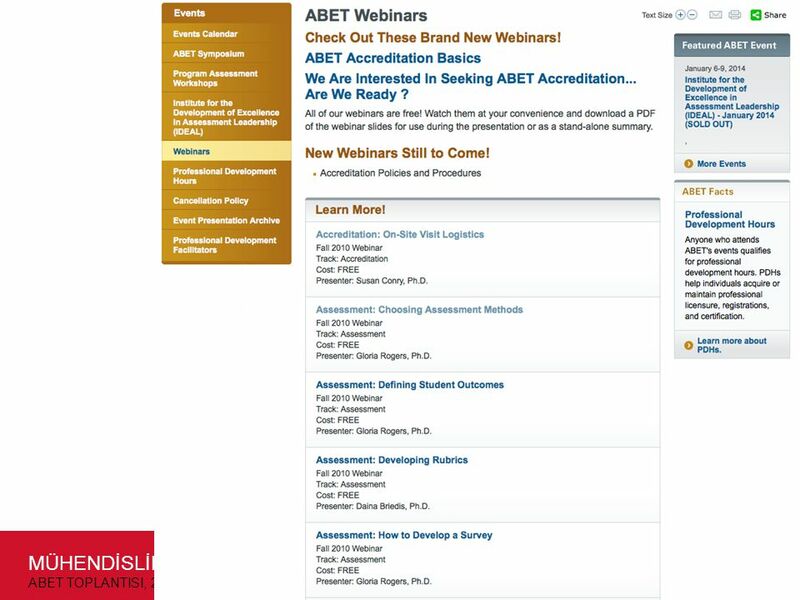 Continuous Improvement The program must regularly use appropriate, documented processes for assessing and evaluating the extent to which the student outcomes are being attained. The results of these evaluations must be systematically utilized as input for the continuous improvement of the program. 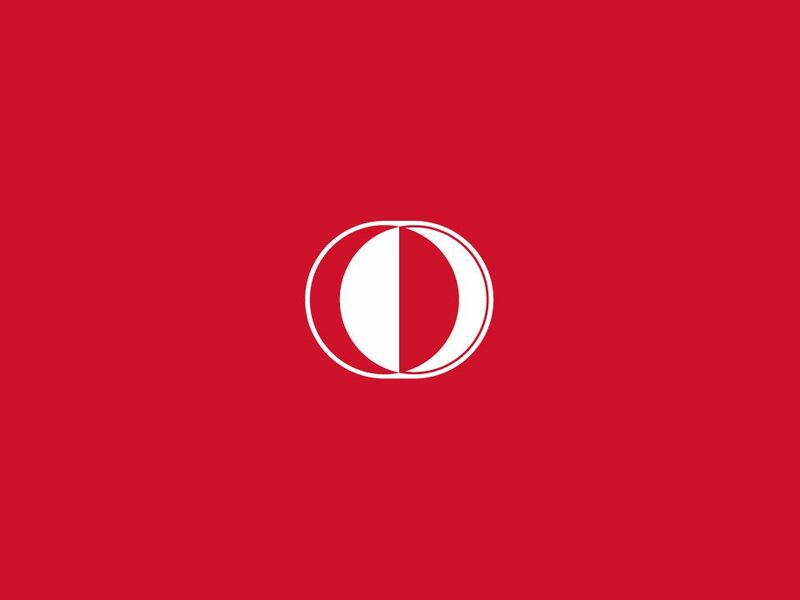 Other available information may also be used to assist in the continuous improvement of the program. 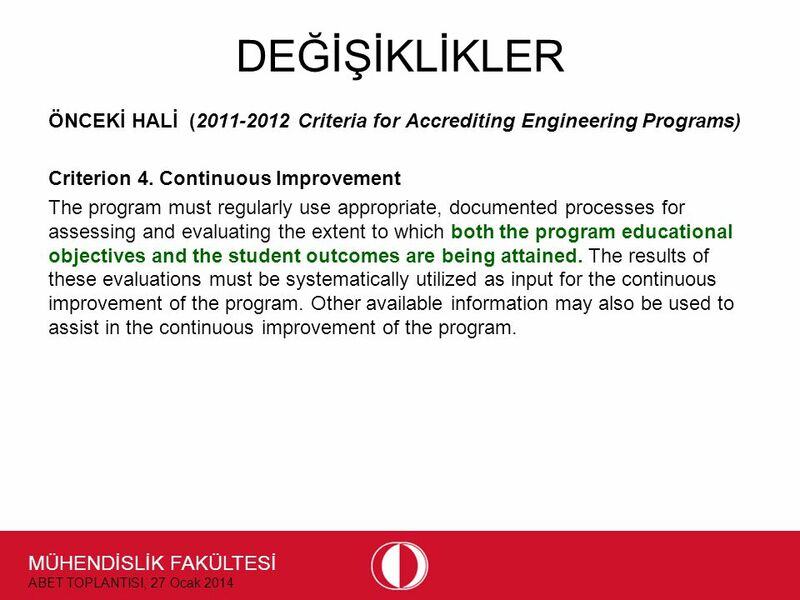 9 MÜHENDİSLİK FAKÜLTESİ ABET TOPLANTISI, 27 Ocak 2014 DEĞİŞİKLİKLER ÖNCEKİ HALİ (2011-2012 Criteria for Accrediting Engineering Programs) Criterion 4. 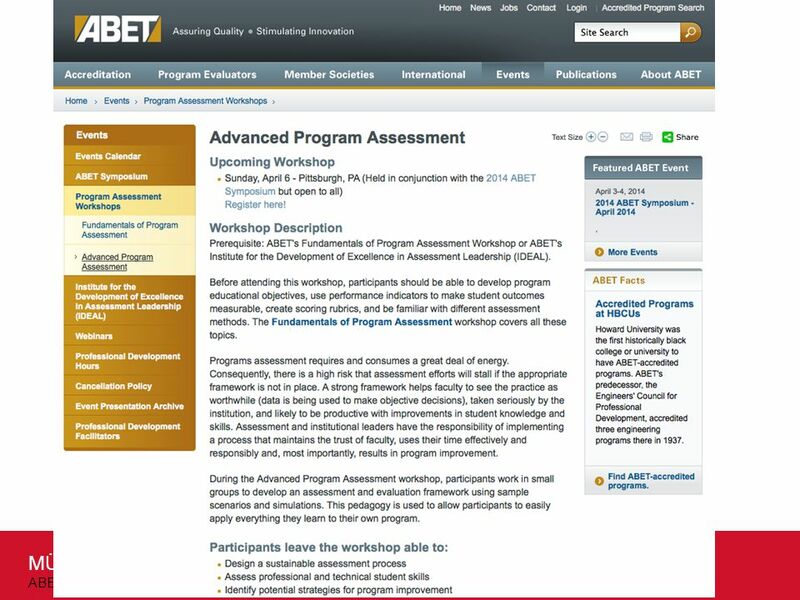 Continuous Improvement The program must regularly use appropriate, documented processes for assessing and evaluating the extent to which both the program educational objectives and the student outcomes are being attained. The results of these evaluations must be systematically utilized as input for the continuous improvement of the program. Other available information may also be used to assist in the continuous improvement of the program. 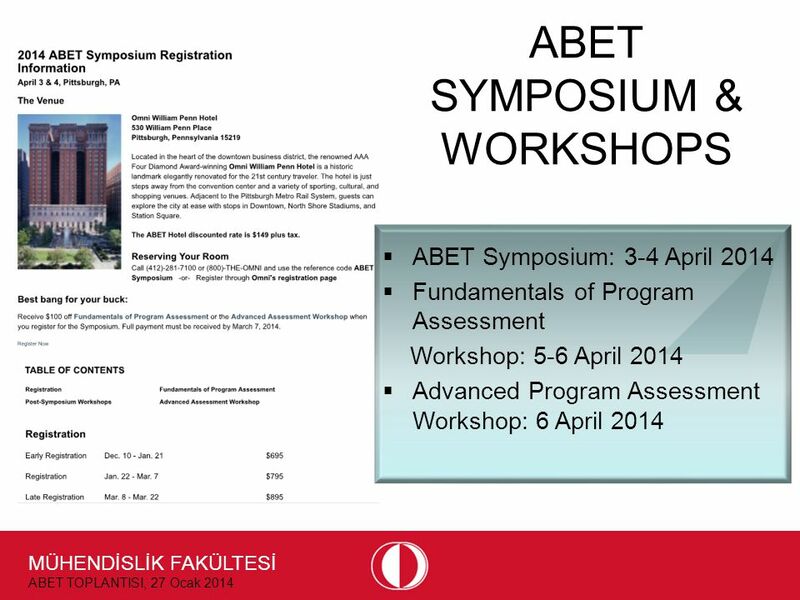 10 MÜHENDİSLİK FAKÜLTESİ ABET TOPLANTISI, 27 Ocak 2014 DEĞİŞİKLİKLER YAPILAN DEĞİŞİKLİK HAKKINDA AÇIKLAMA The change to Criterion 4 removes the requirement for a program to demonstrate graduate attainment of program educational objectives. 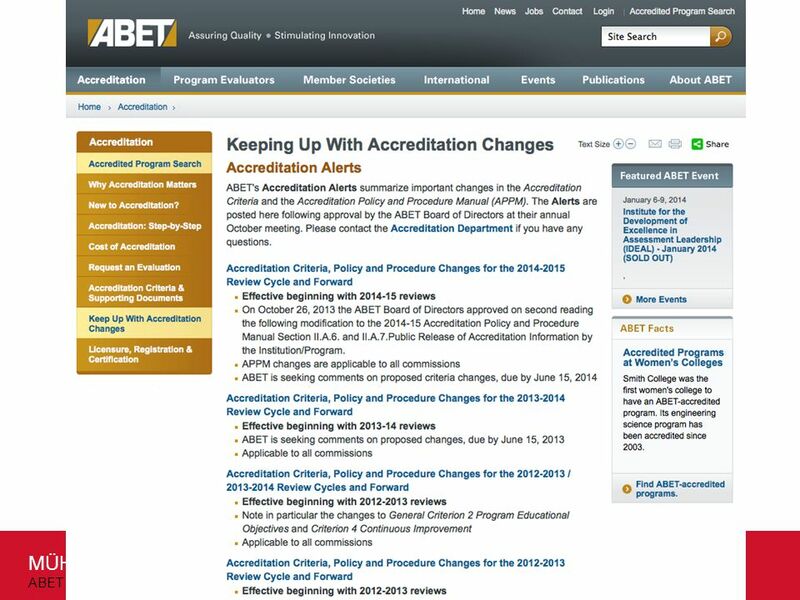 This change removes the stringent requirement for assessment of program educational objectives as is required for a program's student outcomes. 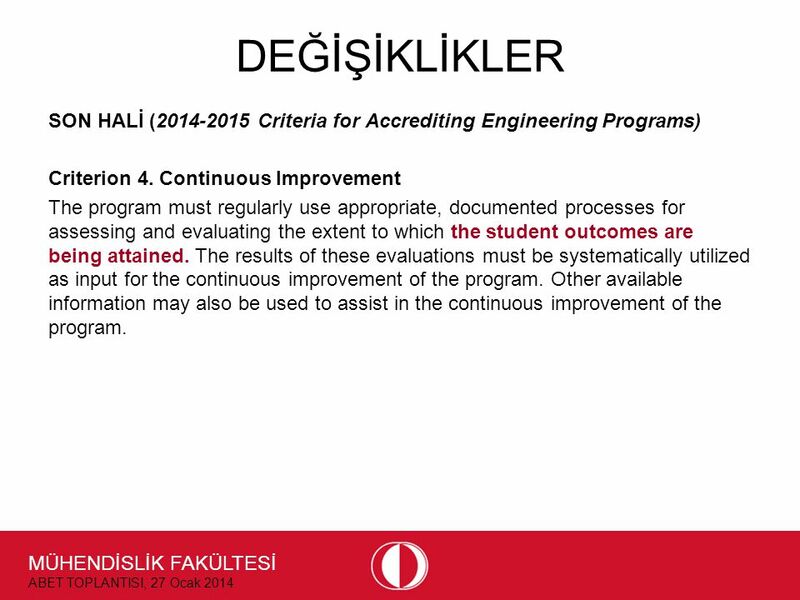 14 MÜHENDİSLİK FAKÜLTESİ ABET TOPLANTISI, 27 Ocak 2014 DEĞİŞİKLİKLER SON HALİ (2014-2015 Criteria for Accrediting Engineering Programs) Criterion 6. Faculty The program must demonstrate that the faculty members are of sufficient number and have the competencies to cover all of the curricular areas of the program. There must be sufficient faculty to accommodate adequate levels of student-faculty interaction, student advising and counseling, university service activities, professional development, and interactions with industrial and professional practitioners, as well as employers of students. 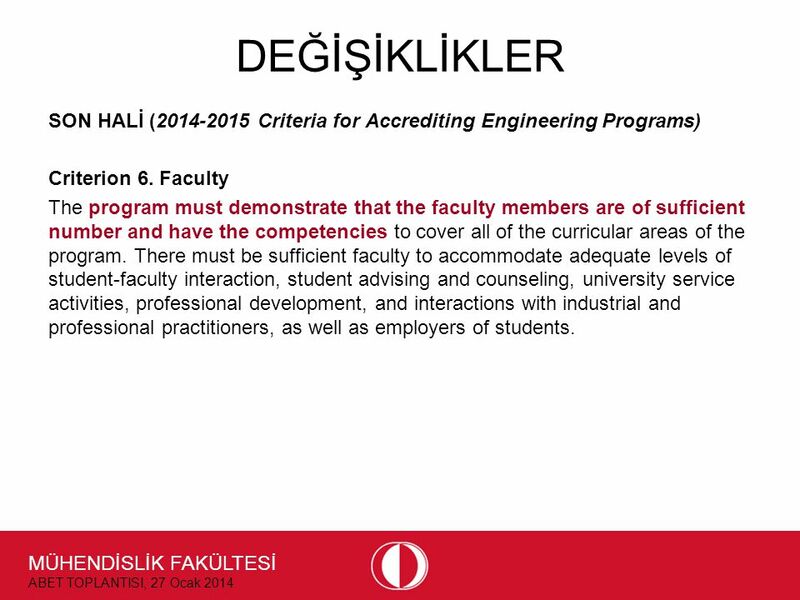 15 MÜHENDİSLİK FAKÜLTESİ ABET TOPLANTISI, 27 Ocak 2014 DEĞİŞİKLİKLER ÖNCEKİ HALİ (2013-2014 Criteria for Accrediting Engineering Programs) Criterion 6. Faculty The faculty must be of sufficient number and must have the competencies to cover all of the curricular areas of the program. There must be sufficient faculty to accommodate adequate levels of student-faculty interaction, student advising and counseling, university service activities, professional development, and interactions with industrial and professional practitioners, as well as employers of students. 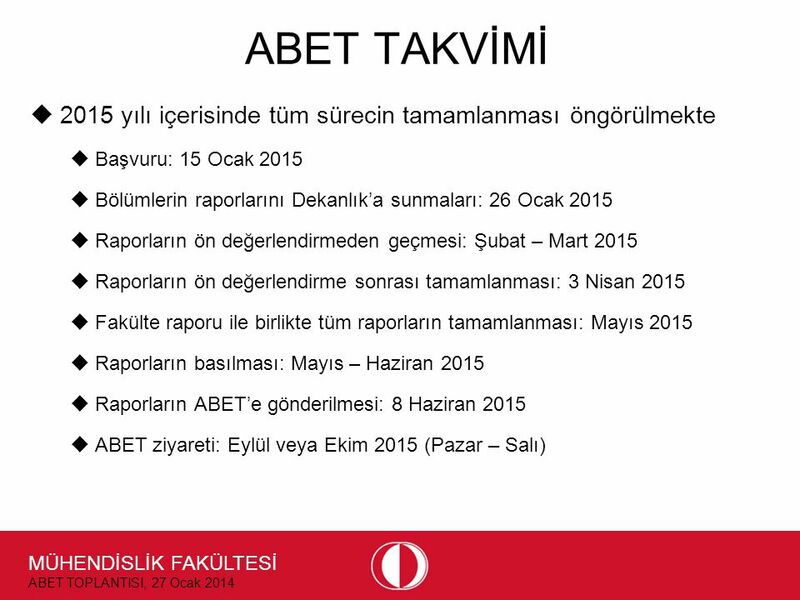 16 MÜHENDİSLİK FAKÜLTESİ ABET TOPLANTISI, 27 Ocak 2014 DEĞİŞİKLİKLER YAPILAN DEĞİŞİKLİK Criterion 6. Faculty: The program must demonstrate that the faculty membersmust beare of sufficient number and theymust have the competencies to cover all of the curricular areas of the program.